Puerto Rico's Medical Tech Plants Worry U.S. Tax Plan Could Kill Storm Recovery : Shots - Health News Drug companies and medical device makers in Puerto Rico are still struggling with power and staffing shortages. One device manufacturer says the future of his industry on the island is uncertain. 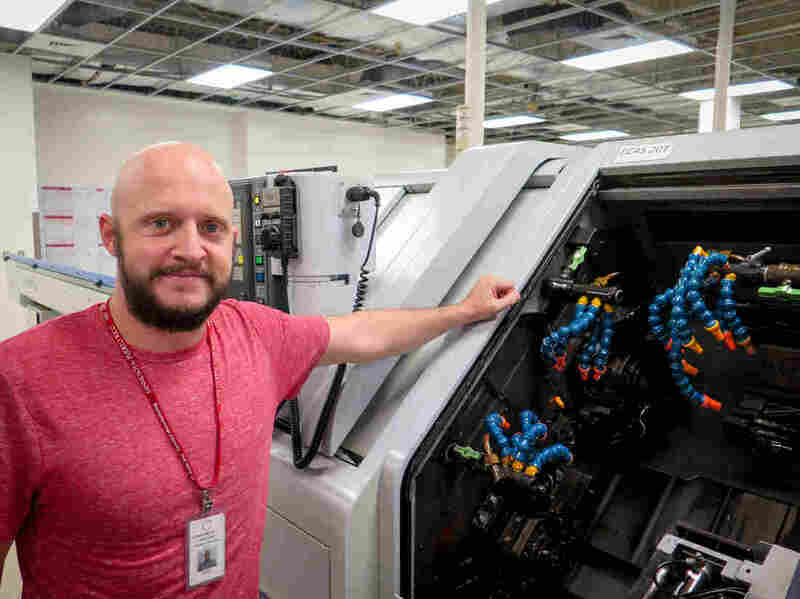 Jared Haley, general manager of the C-Axis plant in Caguas, Puerto Rico, says computer-operated milling machines like this one can cost more than a half-million dollars. Heat and humidity in the plant after Hurricane Maria left many of the machines inoperable, Haley says. In Caguas, south of San Juan, Puerto Rico, Jared Haley is fighting a daily battle at C-Axis, the medical device manufacturer where he's the general manager. The power has been out at his plant for nearly three months, since Hurricane Irma. Operating on emergency generators, the plant restarted operations last month and, Haley says, is delivering all its work on schedule. But he's not happy now with the plant's condition. Walking into his factory, he laments, "This shop used to look like a doctor's office." Not now. Walking through the plant, the damage from Hurricane Maria is evident. Hurricane Maria caused extensive roof damage and flooding. Many ceiling panels are missing. A temporary roof installed after the storm is leaking. By the time Haley and some of his employees got back days after the storm, heat and humidity had damaged much of his equipment. He says: "We have brand-new, $500,000 pieces of equipment that now look like they're 100 years old. Everything rusted on them." 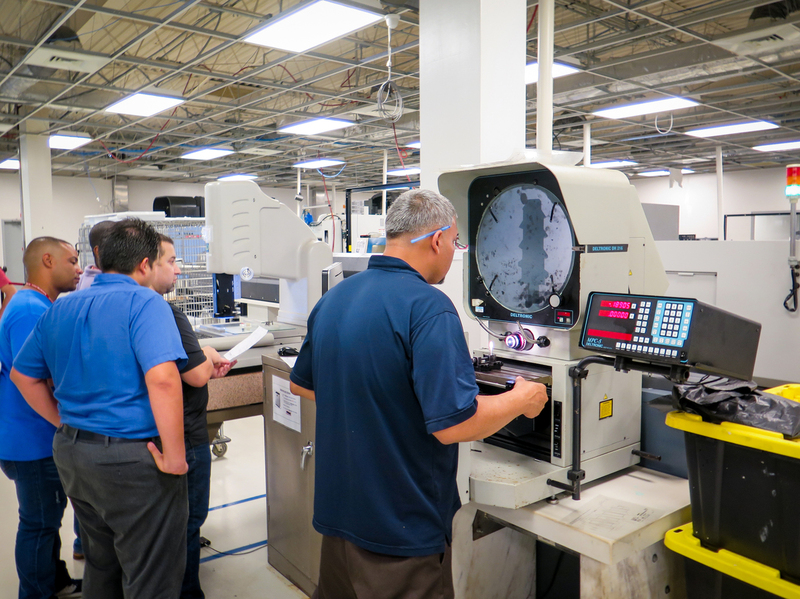 C-Axis makes parts on contract for some of the big medical device companies. It uses its computer-operated milling machines to make parts out of titanium, stainless steel and plastic. "This machine makes bone screws and anchors," he says. In another part of the shop, he examines finished components that will go into a 13-part assembly. "That assembly is used in bypass surgery for the harvesting of the vein in the leg," he says. Because Caguas is in the mountains, cellphone service in the area has remained spotty since Maria. Many of Haley's employees were hit hard in the storm, and some have left the island. Haley estimates he's lost more than 10 percent of his workers. "We've been trying to hire in this climate, which is very interesting," Haley says. "There's no communication, no phone. How do you get employees? We just made a sign and put it outside that says 'Now Hiring.' "
C-Axis employees came back to work days after Hurricane Maria. The plant has been operating via emergency generators, with no air conditioning available on the factory floor. Across Puerto Rico, dozens of medical device and pharmaceutical manufacturers are facing similar challenges. More than two months after Hurricane Maria, the only power for many of these companies comes from emergency generators. They're also facing logistical problems and staffing shortages that have left some manufacturers unable to keep up with demand. Because there was a shortage of the saline bags used to inject IV drugs in patients, the FDA recently stepped in and approved imports from overseas facilities. Another medical device company, Medtronic, has four plants in Puerto Rico. Medtronic's Fernando Vivanco, senior director of corporate communications, says his company also lost employees and is looking to hire 300 new workers. Medtronic now provides its employees with aid and services never offered before, Vivanco says. "We've gone as far as doing things like providing free meals for our employees, ensuring that they have water and food that they can take home in the evenings," he says. Medtronic now is offering on-site day care and even a laundromat for workers. Maria is expected to have a $55 million to $65 million impact on Medtronic's bottom line. But Vivanco says the storm hasn't affected the company's commitment to staying in Puerto Rico. "We have a talented and skilled workforce there," he says. "And we continue to see a future on the island." But after Hurricane Maria, manufacturers in Puerto Rico are now facing what some are calling a potential man-made disaster. It's a provision in the tax bill that recently passed the House that would impose a 20 percent tax on goods made in Puerto Rico and shipped to the U.S. mainland. Puerto Rico's Gov. Ricardo Rosselló and nonvoting representative in Congress, Jenniffer González, lobbied hard against that provision. González says she's received assurances from Republican leaders that if the measure passes the Senate, the part affecting Puerto Rico will be fixed before final passage. Manufacturing makes up about half of Puerto Rico's economy. A decade ago, Congress phased out an important tax break that attracted manufacturers — especially pharmaceutical and medical device companies — to the island. Since then, many companies have left. If this new provision becomes law, Julio Benitez, with Puerto Rico's economic development agency, says he worries that many other manufacturers may follow suit. "They will have to consider seriously their future," Benitez says. "Because, at the end of the day, we're talking about money." At C-Axis, general manager Haley says the plant is getting a new roof soon and he's working on an insurance claim so he can replace his damaged equipment. He says he'll do whatever he can to keep his employees working. "This is a time of need and I have no interest in not giving it our all," Haley says. "But it only is going to take a couple of missteps and we won't have the ability to do that." He is frustrated with the federal government over the slow pace of recovery. But Haley is even more upset about the tax provision. "We're U.S. citizens," he says, "and our government has failed us."